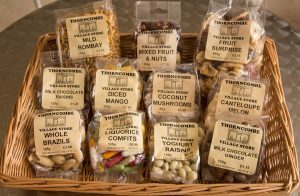 Visiting Thorncombe for a Short Break? 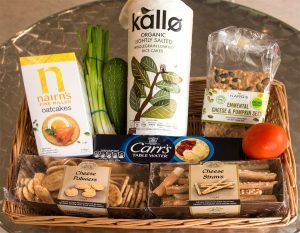 Just give us a call and we can make up a delicious food hamper ready for you. A seasonal choice of fresh fruit, salad and vegetables are always available in store. We have daily deliveries ensuring produce is in peak condition. 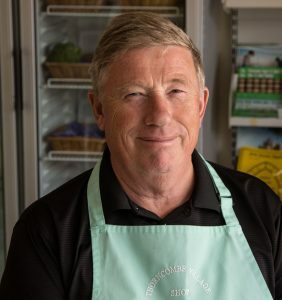 We aim to stock as much locally-produced food as possible, saving on food miles and giving you the chance to have the freshest and best food available. Our local Sadborow Pheasant and Venison is in stock in season, as well as Forde Abbey strawberries. 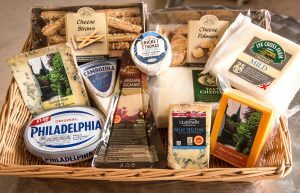 We also sell a range of delicious cheeses from Leopard Dairies in Iwerne Minster and from Lubborn Creamery at nearby Cricket St. Thomas . 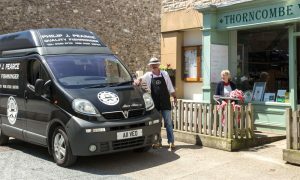 Our milk is delivered daily by Les from Broom’s Dairies, and we stock traditional Free-Range eggs. 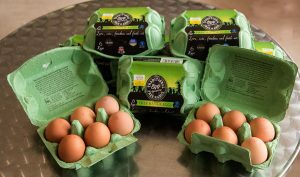 We sometimes also have free-range duck eggs – a delicious alternative. Our bread comes from Evershot Bakery a local artisan baker, baking bread for over 150 years. We have daily deliveries and will happily take orders. 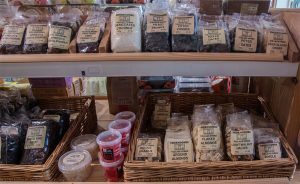 Evershot Bakery offers a wonderful selection of specialist artisan breads such as spelt, French Sticks, Speckle loaves and wholemeal. 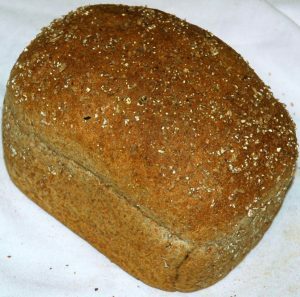 Their cobber is one of our most popular loaves. Totally irresistible, and great for gifts. We sell fresh and frozen meats as well as succulent meat products such as pies and pasties. 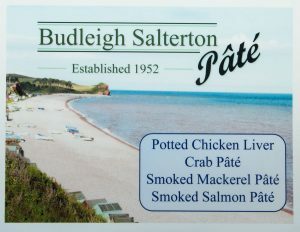 One of our most popular lines is locally-produced Budleigh Salterton Pate, utterly delicious on crackers or toast, as a starter or just lunch. Why not give it a try? 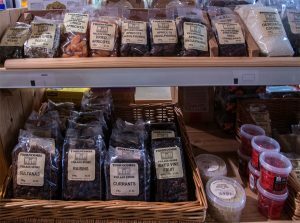 We stock all your tinned essentials as well as baking goods – a wide range of different flours for bread-making, nuts, dried fruit and various sugars. Our own-branded goods offer customers greater value. We also offer a wide range of pet foods as well as cleaning products, batteries and firelighters. With winter just around the corner we have a wide stock of car products such as deicer, salt and windscreen scrapers at reasonable prices. Want a tea or coffee that is something special? Call in to see our great range of Miles, Twinings and other teas. Come in and try our selection of Ice Creams produced by local producers Salcombe Dairy and Marshfield . We pride ourselves on offering an excellent selection of value for money wines. We aim to have both a quality red and white priced at affordable prices. The red will frequently come from South Africa or South America and the white is likely to be from Spain or Italy. 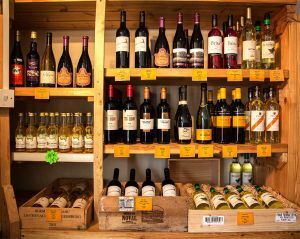 We carry limited stocks of wine enabling a regular changeover in choice. We are proud of our extensive range of beers. Our very own local Gyle 59 is always popular. 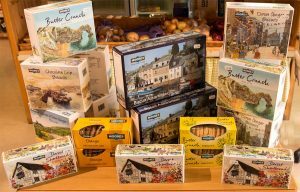 We have a wide and tempting range of savoury biscuits and snacks. 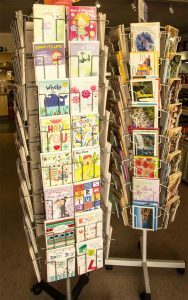 We offer a large range of many occasions Cards in the shop. 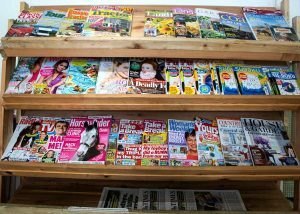 Magazines and Newspapers can be ordered for collection to guarantee you get the paper you want. Alternatively pop in and grab one from the shelf. 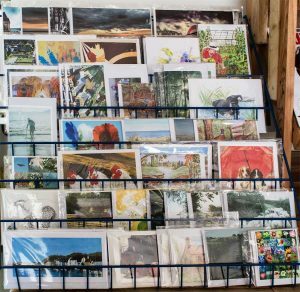 We also sell locally created cards and paintings at reasonable prices. Drop your Dry Cleaning and Laundry off at the shop – save yourself a trip into town. Buy your Air Ambulance Lottery tickets here. on Monday afternoons between 1 and 3 pm. £5 donation to the shop if he can fix it. A home visit will be £10 if I fix it (1 hour or so). 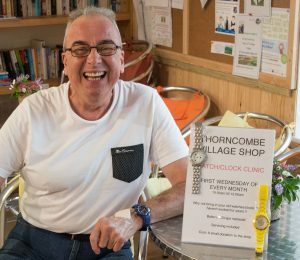 Bring in your old watches or clocks that haven’t worked for years, every first Wednesday morning in the month from 10.00 til 11.30. Batteries and straps replaced. 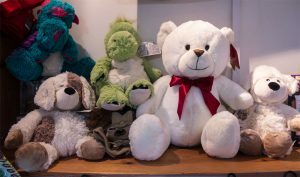 No fees, just donations to the shop. Sit in comfort with a coffee while Derek fixes your watch. 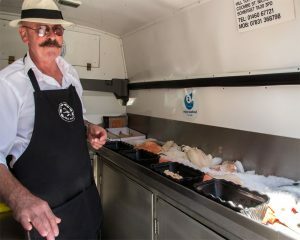 Local Fish Man “Phil the Fish ” parks his van outside the shop every Tuesday from 12.00pm to 12.30pm. A cafe customer chats to Phil outside the shop.